When the National Security Policy was released in 2004, it set in motion a series of initiatives to improve maritime situational awareness. 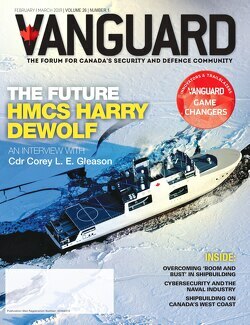 While the most prominent was the Marine Security Operations Centres (MSOC) – a joint effort among National Defence and the Navy, the RCMP, Canada Border Security Agency, Coast Guard and Transport Canada to detect, assess and respond to maritime threats through collaborative fusion centres on the east and west coasts and the Great Lakes – another piece of that national maritime picture will fall into place later this year with the interdepartmental maritime integrated command, control and communications (IMIC3) project. As Commander James Day explains, IMIC3 will allow Navy and Coast Guard vessels to securely exchange information in near real time, and collaborate on a common national maritime picture that will improve decision-making, supported planning and coordinated response. We have lacked the ability for all government sea going vessels to coordinate their actions and provide information to decision makers, to “talk” to one another without “talking” to one another. In the past, coordination between two vessels would have been by voice. IMIC3 will allow ships to act as moving sensors that will allow others to “see” what they “see.” Ships fitted with IMIC3 will send back data from their local operating area to the MSOCs, which will then integrate its information into a larger picture that can be transmitted to all ships. It will provide situational awareness beyond the line of sight, so ships will know what is going on in areas adjacent to where they are operating. This integrated picture will reduce voice traffic and reduce the amount of human intervention onboard the ship required to feed information from the various sensors. IMIC3 will automatically draw data from the platform’s sensors, and feed that back to the MSOCs. It’s a data exchange system. Also, if a response is required, IMIC3 will assist in that regard. Two ships that may have had totally different tasks can coordinate their actions collaboratively. This is a quantum leap over what we already have. I believe it is going to provide an extremely robust capability. And the more we learn from it, the more we are going to find out what is still missing. IMIC3 will be fitted on the Navy’s twelve Kingston class maritime coastal defence vessels and up to 44 sea-going Coast Guard vessels. Although the RCMP do have patrol vessels, they’re largely coastal vessels and will not be fitted at this juncture. Sensing capabilities will include: Automatic Identification System (AIS), required by all ships 300 gross tons or greater or a crew of 29 or more; and fitted sensors/sources that may be unique to each vessel such as automated radar plotting systems. § AIS information from land–based stations. IMIC3 will be a commercial off-the-shelf product. We’re just completing definition work that will “bracket” the desired solution. We’re going through the project approval process to get implementation funding. It will then go to competition. The configuration management of the ships, docking periods and crew changes will dictate who gets fitted when. The Kingston class configuration management is largely the same – there are some minor differences between vessels – but we should be able to roll that out pretty quickly. There are different classes of Coast Guard vessels so the configuration of the ships is different. However, we will try to do both simultaneously. A total of $10 million was allocated in 2004. It now looks like it will be around $24 to $26 million. But there is a trade off. To buy a piece of equipment, we have what is called Vote 5 funding; for ongoing operating and maintenance costs, we have Vote 1. To feed the MSOCs, the system requires satellite time, therefore Vote 1 money. But because implementation has been delayed due to changes in governments, sorting out policies, procedures and engineering changes between the Navy and the Coast Guard, the amount of money that we have saved in Vote 1 on satellite time could be applied to Vote 5 – it’s a zero sum game. We are optimistic this will be realized. The information sharing aspect of this is not as arduous as it was with the MSOC. The MSOC included constabulatory evidence as well as defence and national security-related information. IMIC3 provides an unclassified picture back to the MSOC; each department can then build its own picture from intelligence within their different stovepipes. The Department of Justice is now reviewing what is necessary, but the un-class nature of the information does not give us the same challenge. The method by which we share that information with the United States probably will be mostly DND to DOD. In other words, the information is federally shared. But there is nothing to preventing sharing with other U.S. agencies that require this information to assist in their efforts in joint continental security. The Arctic is a key concern. As the ice melts and traffic grows, we’re going to need better situational awareness of activities in our waters such as commercial resource exploitation, cruise shipping and sovereignty ingressions. The icebreakers are key. And once the CF-led Polar Epsilon project is complete, likely in 2011, it will use information from RADARSAT 2 to produce imagery that can be added to that picture and shared with both Joint Task Force North and Canadian Coast Guard operations to enhance their understanding. Ultimately, the idea is to ensure people are informed before they make decisions. The ship itself may not have the authority to act, but if decision makers have a comprehensive picture, they can direct the appropriate and proportionate response.